Atlantic General Hospital, near Ocean City, MD, is a community healthcare organization that has achieved quality ratings and awards that compare favorably to its larger competitors. But how does the hospital turn this good news into more than simply “promoting awards”? The awards gave us the “credibility” on which to base a strong message of quality, showing that Atlantic General delivers the same level of excellent healthcare as its larger neighbors. We developed a promotional campaign to showcase the hospital’s achievements in the realm of health expertise and quality care, as documented by the National Consumer Assessment of Hospital Providers & Systems, the Delmarva Foundation, the American Stroke Association and others. The campaign was aimed at informing patients and their families – as well as the broader community – of Atlantic General Hospital’s achievements and what this means for the level of care each person in the community receives. 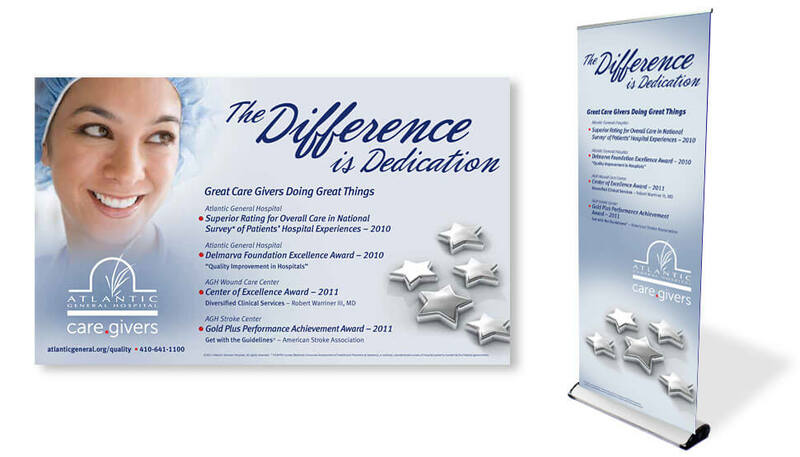 We created a campaign theme – The Difference is Dedication – to anchor a variety of communications vehicles such as web pages, print advertising, display banners, and informational materials that were provided to donors as well as distributed in physician offices and area clinics. The entire campaign helps build and maintain the hospital’s reputation and fits nicely within its institutional identity and branding platform.